A subsidiary of Pan Continental Shipping Co., Ltd.
범주인터내셔널㈜는 1986년에 설립된 국제복합운송업체로서 지난 30여년간 국제물류업계에서 많은경험과 노하우를 축적하고 고객의 신뢰를 바탕으로 우리나라 수출입화물 운송의 일익을 담당하고 있습니다. 범주인터내셔널㈜는 일본/중국/동남아 지역 컨테이너화물을 운송하고 있는 국적선사 범주해운주식회사를 모회사로 두고 있으며, 우리나라 해운의 산파역을 담당한 협성해운 그룹의 일원으로서 국내 컨테이너화물 육상운송업체인 양양 CTS 주식회사, CY/CFS 운영업체 협성 컨테이너터미널주식회사, 영국 Lloyd의 에이전트인 협성 Surveyors & Adjusters Corporation 그리고 Tramper와 예선운영업체인 협성해운주식회사 등 그룹 계열회사들과 유기적인 협조아래 국제 프레이트 포워딩, 해상/육상/항공 화물운송, 창고업, 3자물류 서비스등 물류 전 분야에서 안전하고 효율적인 원 스톱 서비스를 제공하기 위해 끊임없는 노력과 그 소임을 다 하고 있습니다. 저희 범주인터내셔널㈜을 아껴주시고 사랑해주시는 고객 여러분께 진심 어린 감사의 말씀을 드리며 앞으로도 고객 여러분께서 필요로 하시는 어떠한 요구에도 축적된 경험과 책임의식을 가지고 항상 최고의 서비스를 제공해 드릴 것을 약속 드립니다. BumJoo International Co., Ltd. established in 1986. During the 30 years period, we have run International Freight Forwarding Business successfully with accumulated experience and knowhow supported and credited by our customers. 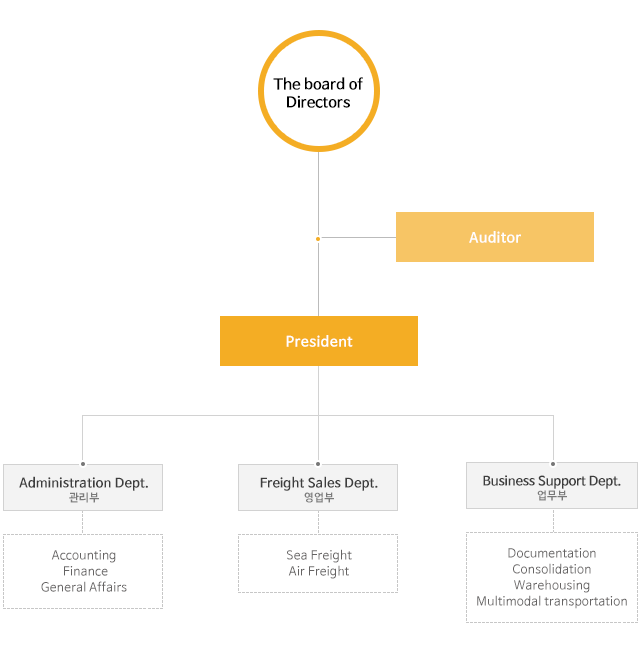 BumJoo International Co., Ltd. is a subsidiary company of Pan Continental Shipping Co., Ltd. who is a Korean flag ship owner/operator running Korea/Japan/China/South East Asia liner business. We provide most efficient one stop service in Land/Sea/Air transportation cooperated by other subsidiary companies of HyopSung Shipping Group; YangYang CTS Co., Ltd. in Container Inland Transportation, HyopSung Container Terminal Co., Ltd. for CY/CFS operation, Hyopsung Surveyors & Adjusters Corporation doing Lloyd agency business and HyopSung Shipping Corporation for tramper business and tug operation. We would express our heartfelt thanks to our valuable customers for their supports having rendered for us for more than 30 years. We promise we will do our utmost efforts for efficient and reliable service in future too for our customers. Thank you. We deliver Total Customer Satisfaction. Name Bumjoo International Co., Ltd.
Changed company name to BumJoo International Co., Ltd. Heavy Lifter ( 45Tons ) 1Unit, / ( 18Tons ) 1Unit, / Forklift ( 7.5Tons ) 2Unit, / Reefer Container Uitilities : Receptacle 30 Units. Pan Continental Shipping Co., Ltd.
Hyopsung Surveyors & Adjusters Corporation. © Copyright 2016 | BumJoo International Co., Ltd. | All Rights Reserved.